Governour's Square offers comfortable homes in a great location! For those who like a more traditional, colonial style of home, Governour's Square (aka Governor's Square) in Reston is the community for you. Developed in the late 1960?s, the Governour's Square townhomes are 3-level homes with exterior brick construction and about 1,600 square feet of living space. A central common area is a great place for children and dogs to play, and the nearby Reston Association paths are perfect for those who like to walk or run. 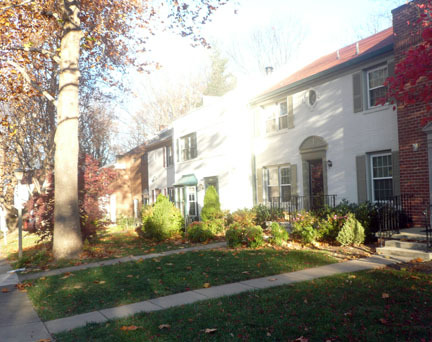 In fact, everything about the location of Governour's Square is great--this small community of townhouses in Reston is less than a 10 minute walk to Reston Town Center, and close to the new Wiehle Metro station. It's also within a few miles of several grocery stores, including Trader Joe's, Whole Foods, and Harris Teeter. For those with young children, Governor's Square is also a quick walk to Lake Anne Elementary School. Check out the current listings in Governour's Square and Reston townhomes here. For every new Like to our Facebook fan page in the month of December we'll donate $1.00 to Cornerstones, formerly Reston Interfaith! Like us so we can give!